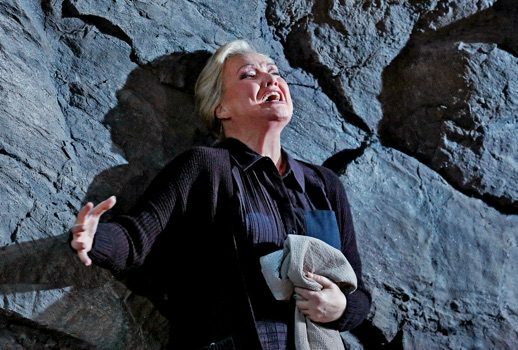 The Metropolitan Opera once again provided an opportunity to hear excellent singing with the return of Janácek’s Jenufa, the centerpiece of which was the performance of Karita Mattila as the murderous Kostelnicka. However, this overall success was diminished by a puzzling production by Olivier Tambosi from 2003; its odd set design and slack stage direction provoked more dissatisfying questions than a fully realized reading of the text. Despite its strangeness, I find Jenufa to be deeply poignant and troubling. The narrative covers a wide terrain between sin and redemption within a Moravian village, the central concerns circulating around pregnancy and birth of a child out of wedlock. Despite the broad acts of domestic violence that constitute the plot, the opera’s characters never sink into caricature. Even a figure like Steva, who could easily be reduced to a sketch of masculine privilege, finds a way to express more psychological depth than expected. Janácek’s compassion for the characters he develops is astoundingly capacious, and I left this performance of Jenufa with an acute sensation of ambivalence. For example, how much, in the end, can we blame the Kostelnicka for her actions? Was her transgression provoked by love or fear? Is it wrong for Jenufa to forgive and love Laca, in the end, even after the violent outburst occurring in Act I? When I heard that Mattila would be singing the Kostelnicka at this performance, I imagined a kind a bombastic, gleeful campiness. The last time I saw Jenufa, Mattila was in the title role, and her embodiment of the younger character was full-throttled and intense. The idea of her singing the stepmother at first evoked in my mind notions of a performer on the decline (perhaps unfairly and cruelly), aging into camp, a swan-song one might watch at midnight on YouTube. Mattila imbued her actions with a terrible sorrow and frustration; and a seemingly intuitive sense of maternal care seemed to provoke her outrageous choices. Not to mention, Mattila’s singing was consistently elegant, especially in a role that could easily rely on strident screeching and wobbly phrasing. In the title role, Oksana Dyka was similarly admirable, and she made a fascinating counterpoint to Mattila’s twisted Kostelnicka. For as much as Mattila projected a complicated, internal struggle, Dyka suffered with a countenance of naïve, simplemindedness—almost Christ-like in its passivity. When I suggest simple, though, I don’t mean stupid. Her Jenufa operated through a unique, almost queer complacency. Suffering—certainly—but never quite willing to question or subvert her pain, operating from a stance of radical love. And her bright, laser-like voice moved through the score evenly, especially during the more strenuous sections of Act II and III. Daniel Brenna was less consistent in the role of Laca, Jenufa’s assailant and lover. In certain passages, his muscular tenor turned shrill. Also, his approach to the character was significantly less refined than Mattila and Dyka; the singer seemed mostly preoccupied with planting his feet in order to launch his voice. This quality made the final moments of the opera difficult to accept—the man we once understood to be Jenufa’s enemy had suddenly become her beloved; and while this transition was a provocative notion, in all its political incorrectness, it was awkwardly made. In contrast, Joseph Kaiser as Steva, and Hanna Schwarz as Grandmother Buryja, provided reliable, three-dimensional performances that added to the evening’s dramatic texture. Kaiser, especially, managed to bring to the surface Steva’s repressed remorse and dread, drawing genuine pathos from a character that could merely function within the plot. The orchestra, conducted by David Robertson was keenly attentive to the needs of the singers, willing to pull back when necessary, in service to the score’s drama. However, while the musicians each brought a genuine dedication and commitment to their roles, fully developing them into singular creations—the sum larger than all the parts—the production’s direction and set design drew my focus, and not in a manner that contributed to the evening’s success. As I have often thought of productions at the Met before, a strain of arbitrariness seemed to weave its way through the proceedings. Generally speaking, the blocking felt contrived and stiff, characters moving from one section of the stage to the other, merely because they were instructed to do so by the director; this was especially evident when the chorus was on stage. The production’s set design was confusing. For example, why was there a boulder in the middle of the Kostelnicka’s house, and why did that house resemble a modernist barn? These questions were frustrating to consider. Even so, I would be lying if I were to say that I didn’t enjoy some austere quality of the design—especially the stark images of sky and land that were cleverly evoked, locating the action within an agrarian, earth-bound setting. In the end, the drawbacks of the opera’s direction could not quell the vitality of its singing, which was enough for me to leave the house satisfied. In the spirit of the opera’s plot, whose central theme is forgiveness, I suppose these mild offences may be forgotten—especially when there remains so much wonderful singing to remember.